Once again, EVE is dying. This time it’s for real. Many people on the EVE subreddit have come to that conclusion as a result of a gloomy analysis by Ripard Teg. Irrefutable graphical evidence has shown us that the number of logged-in accounts has declined continuously. Compared to the highest peaks, we now share our gaming experience with roughly 10,000 fewer accounts on average at any given hour, a decrease of more than 30 percent! Statistics are a wonderful thing to twist around an interpret in various ways, but they rarely tell the whole story. Of course it would be wrong to dispute the fact that the amount of accounts logged in on average has declined over the last two years. These numbers tell us something, but do they spell the end of the world’s only single-shard sci-fi MMO? Far from it, I say. Let us look at some other developments. Fanfest 2015 had the second-highest number of visitors ever behind only the 10th anniversary Fanfest. EVE player gatherings are increasing in number and size all over the world. The number of major EVE podcasts has grown over the past few years despite some big names vanishing from the scene. Blog posts about the game have also increased, both in number and frequency. This very site and its development over the past two years is a case in point. Finally, the amount of Youtube videos and Twitch stream channels with EVE-related content continue to increase at a steady rate. Clearly, there is a growing number of players who invest their time and money into creating content and engaging with the game, its community and its developers. Furthermore, if we look at the amount of new accounts created in the time that Ripard Teg has chosen to highlight, then that number remains largely stable. There is a slight downward trend visible recently, but nothing as alarming as the average number of logged in accounts seems to suggest. 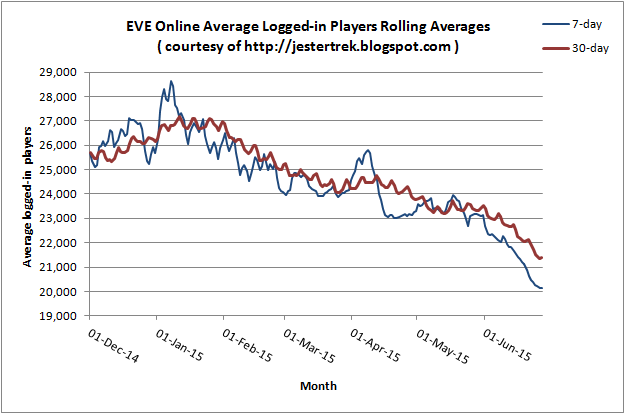 So if there are active and engaged players, even more of whom are forming bonds with the community, and if a roughly stable amount of accounts are entering EVE, why is the number of logged in accounts going down? Many of the doomsayers are actually identifying the correct root causes. Particularly in the last year, we have seen a number of changes coming to the game which influence the amount of accounts online. The Phoebe jump changes reduced the need for cyno alts parked all over the map. Changes in industry and resource distribution made it impractical to maintain a high number of mining, manufacturing and hauling accounts. The ISBoxer restrictions declared it a bannable offense to automate the actions of multiple ships, and finally PLEX prices have risen to a point where the less affluent and more thrifty players will ask themselves whether it is worth scraping together the necessary ISK to maintain accounts which they only use sporadically. Since most multiboxers and players with several alts will log them all in at the same time, the impact will definitely be felt on concurrently logged in accounts. Where a player might have logged in six different alts in the past, they may now only use two or three. In particular, the ability to train alts on the same account by spending PLEX has changed that too. Now it is not necessary to keep an account sustained with PLEX for eventual use. By spending only one or two of them, players can use another slot on the same account to train a character to light a cyno or work as market trader. Another major factor is, of course, the announced sov-redesign. Even before the changes come into effect, they cast their shadow over the regions of sov-nullsec. Coalitions have dismantled major renter empires and nullsec blocs have consolidated their territory or given it up completely. A picture says more than a thousand words, so for comparison, here is a screenshot of the sov map today … … and the same map exactly a year ago The difference is already incredible, and we have yet to see what that map looks like after the first series of sovereignty conflicts sweeps through nullsec after the changes. The pre-emptive measures taken by the different blocs and powers vary. Pandemic Legion decided to drop their Brothers of Tangra renter empire and focus on their core business of devastating large fleets, preferably in exchange for vast sums of ISK. Legion of xXDeathXx went the exact opposite route and expanded their renter space. Northern Coalition initially tried to drive into Fountain, but now they too have completely dismantled their Northern Associates renter territory. The CFC reshuffled its papers, gave up on renting out space, consolidated their territories and rebranded themselves to The Imperium. HERO coalition moved into the southern vacuum left by that operation and so did Black Legion, traditionally an alliance that does not hold sov. People talk of stagnation in nullsec ahead of the changes, but from the outside it looks like there is quite a bit of movement. There is, however, one major factor that could be contributing significantly to the lower number of active accounts. The Imperium has long been known for planning their strategies with foresight and consideration. One of their main goals is stability and prosperity for their members, and by sticking to this, they have managed to create large areas of effectively pacified nullsec space. Their leadership is actively avoiding any major sov-related conflict until CCP implements “fozziesov,” and that naturally results in less players needed for maintaining their space. At the same time, they are committed to preventing their community from withering away, so they are promoting an alternative to EVE online through their website and Twitch stream. People tend to follow popular FCs, so when celebrities like Lazarus Telraven or DaBigRedBoat are playing H1Z1 instead of taking fleets out, the result will obviously be a temporary migration of players to that other game. So should we worry about this reduction in alts and reduced activity by some nullsec powers? Personally, I don’t think so. I am actually happy to see the number of alts reduced. While high numbers of concurrently logged in accounts may look good on paper, the game does not become any better with the presence of cloaky campers, idle cyno alts waiting for a potential hotdrop, AFK miners, plex farmers, multiboxing incursion runners or market alts that constantly -0.01 every order. 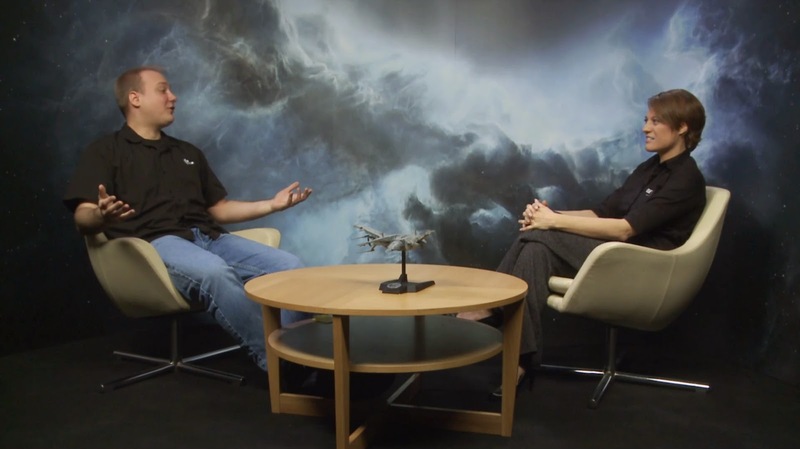 CCP Fozzie said in a recent interview that CCP prefers a person behind every account that is online rather than people populating the game with alts, and I fully agree. I would rather play with 20000 active players than 36000 with 16000 accounts basically acting like bots. Feel free to substitute “bots” with “a superfluous annoyance for all the active participants in the game.” Despite my generally positive view, I do not want to completely disregard the potential for a problem in the future. EVE, as we all know, is a venerable game by today’s standards. A significant percentage of the player base has been around for many years, and while EVE scores well at retaining players after a certain threshold, the rate at which the oldest players leave is second only to the youngest. The reasons vary, from family to work to a change in lifestyle to graduation. There are many reasons why players who have “seen it all” will eventually say “so long, and thanks for all the pew”. It is also those long-term players who are, on average, most deeply rooted in their own communities and have the largest amount of alts. Like The Imperium drawing many of their community to another game while they are waiting for the next act to begin, tightly knit groups of players could easily decide to join their best EVE friends in leaving, or maybe they simply don’t feel like looking for another community when their old one disbands. This phenomenon is not likely to come to an end as the playerbase ages further. Increased loss of older players will only become more likely over time. The sov redesign could actually exacerbate that problem. What if the changes turn out to be an immense source of frustration for players who have spent years mastering the tactics of the old sov-system? What if major community drivers and content creators move on? Over the years EVE online has become vulnerable to shocks, which could result from an aged and highly integrated player base. That makes it ever more important to work hard at attracting new players, maybe even new kinds of players. If the power vacuum and/or chaos resulting from the new sov-system is sufiicient, then there could be new player groups entering sov-nullsec who grow up knowing only “Fozziesov” and learn to deal with it in ways the adapting playerbase has not conceived. Eventually, a younger generation will have to take over the sandbox, and so far it looks like EVE will be around long enough to see their rise. That said, if the amount of incoming new accounts drops faster than the concurrent user count, if the numbers of visitors to fanfest decline, if EVE Vegas doesn’t attract players anymore, if podcasts, streams and blogs close down and no new ones replace them, then we can ask whether or not EVE is dying. Right now, EVE is just shedding dead skin.